Assuming a SMPTE 352 payload packet is present on the SDI signal, this metadata determines how the video content should be viewed, the data structure, the colour space, closed caption, parental control, timecode information, etc. The audio embedded in the SDI data stream can be AES/EBU, Dolby E, Dolby D or Dolby D+, depending on where in the production chain you are looking. Monitoring AES/EBU audio content is straightforward, but requires it being de-embedding from the SDI data stream. Dolby on the other hand is a little bit more challenging because you not only have to de-embed it, but you then must decode it to ensure it is correct. The monitoring challenges change when you are working with SMPTE 2110 content as the video, audio and ancillary (control and metadata) are separated into elemental streams so that they can be accessed and processed independently or all together. You need to be able to monitor these elemental streams independently while they are being processed and monitored re-combined before transmission. You need to be able to monitor the quality of the image in its raw state but also with its associated metadata applied. This of course includes its colour space, dynamic range, closed caption/subtitle content and parental guidance. You also need to monitor the audio in whatever form it is transmitted. This includes its channel configuration, PPM levels and its programme loudness and ideally you need to able to hear it to be sure it is correct. With more mixed SDI / IP and ‘all IP’ installations being designed and implemented it raises a few additional challenges for audio engineering. 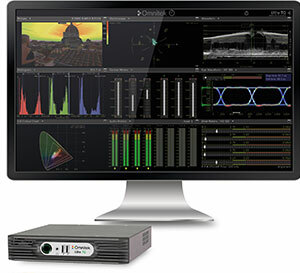 For NAB, the Omnitek Ultra TQ gained the ability to analyse and decode Dolby E, Dolby D and Dolby D+ audio for monitoring and quality checking. This new functionality coupled with the Ultra TQ’s SDI / 2110 / 2022-6 connectivity went down well with broadcasters who are looking for an ‘all in one’ solution for current needs with a ‘foot in the door’ for future requirements. To allow the decoding of Dolby, AES/EBU input/output as well as provide analogue audio monitoring functionality, a new mezzanine board has been designed for the Ultra product range. This board provides the AES/EBU audio connectivity required to monitor the de-embedded audio from the SDI/IP stream and decoded Dolby content. This additional audio functionality has been implemented due to demand from broadcasters who need to be able to ensure the quality of all aspects of their content before server ingest and broadcast but also because the adoption of IP standards such as SMPTE 2110 means that it is essential to be able to check all of the elemental streams (video, audio and ancillary) are correct. With digital audio capture prevalent, being able to hear the audio quality anywhere within the production chain is a significant benefit, whether its AES/EBU or Dolby audio. To monitor the audio elemental stream is quite straight forwards. The Ultra TQ uses an SMPTE 2110 SFP module that can be configured from within the Ultra user interface. This allows IP addresses to be setup for video, audio and ancillary elemental streams. The user can then select how to analyse the video, audio and ancillary data. The Ultra TQ offers the same instruments as it does for SDI audio analysis. These include the Audio Status and Audio Errors tiles to ensure that the data structure is correct, the Audio Meters to ensure that channel assignment and levels are correct, the Loudness tile to ensure that program loudness is within required limits and the AV Delay tile to allow the relative measurement of each audio channel with respect to video. With the addition of the Dolby Metadata, Dolby Decode and AES options, the Ultra TQ can also be used to check Dolby Metadata, Dolby audio channel assignments, Dolby programme loudness as well as being able to hear the decoded Dolby audio via headphone and AES/EBU outputs. The Ultra TQ is fully configurable and allows any audio channels to be assigned to the headphone output and up to 8 channels to be assigned to the AES/EBU outputs available on the back panel via a ‘break-out’ connector. Prior to NAB, a number of broadcasters had already purchased the new Audio board to allow them to extend their QC activities to include Dolby Metadata checking and Dolby audio monitoring prior to server ingest and transmission. Omnitek operates a flexible upgrade process to accommodate changing industry needs and workflows and allow customers to migrate the functionality of their existing Ultra product to any other variant. The new audio board to support Dolby metadata and decode as well as AES input/output will be available as a factory upgrade for existing customers.